Who else wants a web site redesign? Kermans Fine Flooring launched today. 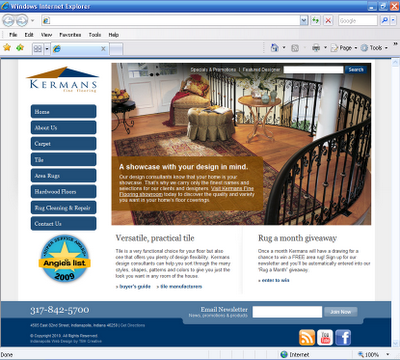 Kermans Fine Flooring in Indianapolis (Castleton) hired TBH Creative as a partner in their web site development project. Their old web site was static, had very little information, was slow loading, and overall out-dated. The goal for the new web site was to offer a clear message about Kermans high quality services and display a clean and strong design to represent their high end products. TBH Creative put together a web site for Kermans with a back-end content management system to keep information up-to-date. The design is intuitive, effective, and contains galleries to show off their carpet, tile, area rugs, and hardwood solutions. If you have web site needs, TBH Creative would love to help. Contact us today for high quality web site solutions in Indianapolis.